Whether you’re a woodworker, an R/C enthusiast, an electronics buff or an occasional tinkerer, this garage workshop fulfills your dream of an organized place to enjoy your hobbies. 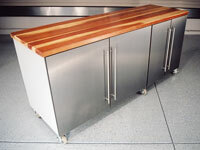 It features a corner workbench with a large surface area for projects, and enough cabinet storage for all the tools, supplies and bulky items you need to have handy but neatly stored out of sight. 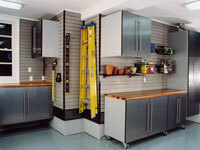 Use these garage organization ideas to get your garage organized and keep it that way! Use special hooks and reels. 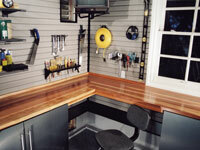 This garage also features a mobile workbench that can roll easily and anywhere, or be positioned against the wall to allow plenty of room for cars. 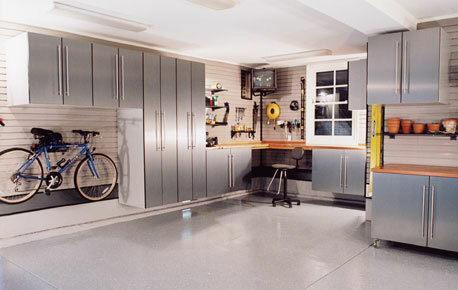 The walls of this ultimate garage are fitted with Garage Envy’s patented WallscapeTM slatwall, which offers mounted and fully adjustable shelves, hooks, handles, tool holders, bins and baskets to organize everything.